I learned something over my years as a registered nurse. Modern medicine, with all its researched-backed glory, doesn’t heal. Pharmaceuticals cover up symptoms so you don’t feel quite as miserable. Your body will heal on its own. The problems with using over-the-counter medicine lie in how it manipulates the body’s natural defense mechanisms. That’s why every single drug has a long list of side effects affecting almost every single organ system. I genuinely cringe at work when a patient asks me to explain the new drug their doctor ordered. When I look up the list of side effects, I honestly feel like most pills are better off in the garbage than in the mouths of human beings. As a mom, I have two goals when it comes to the health of my family: 1) to keep my loved ones from feeling terrible and 2) to build a strong immune system for a lifetime of health. I do this by keeping my natural medicine cabinet stocked with things that support the body to heal. 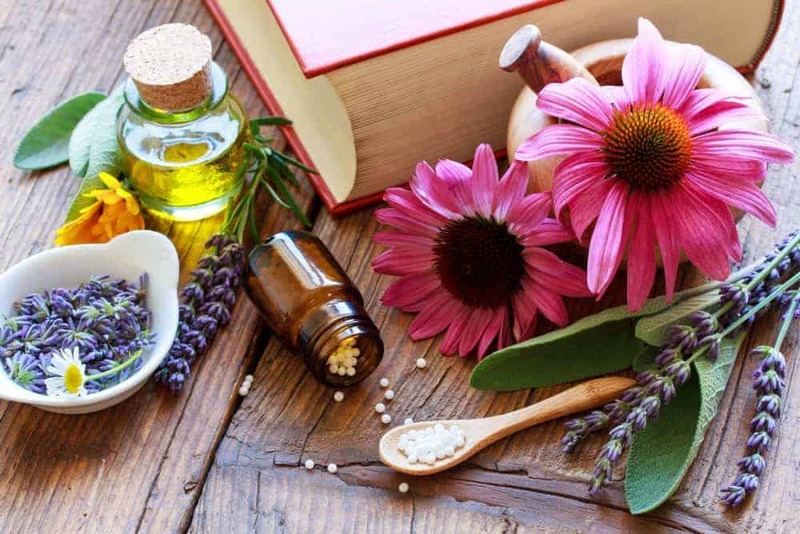 In this post, I will share my favorite natural remedies to keep handy for common family illnesses and some maintenance remedies. Many natural health blogs specialize in a particular type of natural remedy. It seems like essential oils are gaining the spotlight lately because of Young Living. I know some herbalists who can make a potent tincture from their garden. I am apart of a small homeopathy group. We have found homeopathy to be a game changer for many of our families’ needs. I see value in any option that naturally heals. 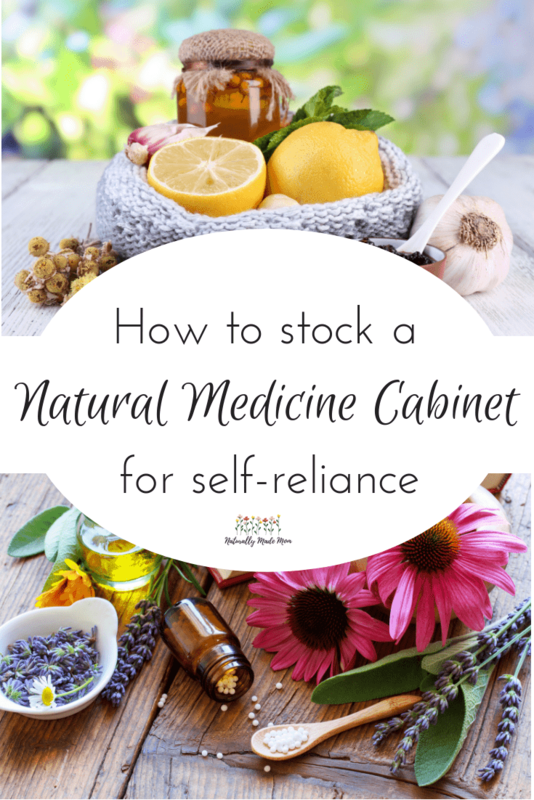 When I was just getting started, stocking my natural medicine cabinet was overwhelming. I wanted to make sure I covered all my bases for emergencies (and with kids, trust me there will be emergencies) so I will be prepared and self-reliant. I am going to be completely frank. After practicing nursing for ten years and now becoming a mom, I put my confidence in natural remedies over a doctor any day of the year. These remedies have contributed to swift healing for my family, which is why I can confidently recommend them to you. What I see in my work as a nurse is people getting increasingly sicker and coming back more frequently. Personally, I try to avoid using pharmaceutical drugs at all cost. You can take echinacea to shorten the duration and intensity of colds and flu. There is a caveat, it must be taken it at the first sign of symptoms to be effective. (source) I was raised taking a tincture of echinacea as a child and still use it today any time I am feeling slightly run down. My favorite way to consume echinacea is via a warm tea but you can also take it in capsules or tinctures. Elderberry is a potent antioxidant that has proven useful for viral illnesses for thousands of years. (source) Elderberry is one remedy I make sure never runs out. I like this elderberry tincture the best. In our home, we use elderberry when any of us are feeling run down by adding the drops to our water. When one person feels run down, everyone gets elderberry in their water so I don’t end up with a household of miserably sick people. We even use elderberry during times of change or stress to help our bodies cope. Cod liver oil is packed with omega 3 fatty acids, Vitamin D, and Vitamin A. We take cod liver oil on a weekly basis to support our immune systems and the healthy growth of our children. (source) Cod liver oil is especially useful in the winter months to keep up the Vitamin D levels while the sun isn’t shining as brightly. Did you know that 80% of our immune system resides in our gut? If you want to be in good health and have fewer allergies, take care of your digestive tract with daily probiotics. (source) You can add natural probiotics to your diet by eating fermented foods like sauerkraut or kefir. I give my son homemade kombucha as a natural way to replenish his gut flora. I posted my kombucha recipe if you would like to make your own. You can also order probiotic supplements to take as a daily vitamin. Homemade bone broth is another excellent home remedy for gut health. Garlic is beneficial for any natural medicine cabinet. It is antibacterial, anti-inflammatory, antioxidant, cardiac protective by lowering cholesterol, and even helps to activate our immune response. (source) We use garlic oil for ear infections. I also keep garlic capsules around for when anyone gets a virus. Garlic also thins the blood so you can take it before a long plane ride to prevent blood clots. Vitamin C is necessary for immune cells to function properly. (source) When we are under the weather, Vitamin C is another supplement we take to help our bodies fight the virus. I do not like using popular vitamin C supplements such as Airborne. If you look at the ingredients, there are a bunch of additives. I like these dissolvable Vitamin C tablets for young kids and these for adults. A little chlorella in a morning smoothie will help with hormone regulation and heavy metal detoxification. (source) I used chlorella when I detoxed my son from the flu vaccine. (I wrote about how he started having seizures after he received this vaccine before I was wiser) Chlorella also helps protect the body from free radicals so I like adding it to our diet at least once a week. *Note: My son is completely free of seizures after I implemented a homeopathic vaccine detox and added heavy metal binding foods to his body. If you are interested in helping your kids reduce the heavy metal burden from their vaccines you can check out this post. I love the magnesium supplement called Natural Calm. It’s a powder you mix with water which makes it taste super crisp. I added Natural Calm to my water during pregnancy before I went to sleep to help with nighttime leg cramps. Magnesium is an essential mineral for proper nerve and cardiac function. It is a helpful supplement for headaches as well. I love chamomile essential oil because it is calming to the neurologic system. I use this oil in baths for teething pain or when my kid is having a particularly grumpy day. A drop of chamomile essential oil mixed with coconut oil can be rubbed on a baby’s belly to ease colic. I keep tea tree oil handy for wounds and bites. Tea tree oil has antibacterial, antiviral, and antifungal properties making it a great natural choice for open wounds protection (source). Tea tree oil is even powerful against MRSA. (source) I mix tea tree oil with coconut oil and a dab of Manuka honey instead of using triple antibiotics like Neosporin when my little one gets a scrape or bug bite. I discovered Frankincense years ago when I was looking for a way to naturally tighten loose skin. Since then I have applied it under my eyes every night to help slow down my aging appearance. Come to find out Frankincense has gobs of medicinal uses including helping to balance hormones and lowering stress levels. (source) I included Frankincense on this list to help all of us through the trials of motherhood. Lavender is another super versatile but gentle essential oil that is great for kids. I put Lavender in a diffuser in my son’s room to help him sleep better. I also diffuse it around the house if we are going through a stressful transition. A few drops of peppermint oil in your tea can soothe your digestive tract and help you sleep. I also like to use a bit of coconut oil and a drop of peppermint oil rubbed on the back of my neck for a tension headache. Do not use peppermint oil in children under the age of six. I love to keep herbs, supplements, and essential oils around the house. They genuinely help my family to maintain a state of health. However, nothing in life is perfect and even in this naturally-minded lifestyle, there are times when illness strikes and we are simply uncomfortable. Sometimes my mind gets entangled in worry about things outside of my control and I lose sleep over it. Other times I get a massive headache or my son is having severe teething pain. My husband has suffered from allergies for years and used to pop Claritin like candy for five months straight. It is beyond the scope of this post to teach everything about how to use homeopathy, and I am not an expert myself. I can recommend that you do two things to be prepared especially during your mothering years. Get a starter homeopathy remedy kit and keep it with you at all times. Between these two things and a small bit of intelligence, you can treat your family members’ symptoms naturally and relieve their suffering without a doctor. I will admit I was a skeptic at first. I mean, I am a registered nurse. I had never heard of homeopathy before so I thought, how can it really work? If it really works without side effects then why aren’t we using it in hospitals and doctors offices? I am not sure when, but at some point in our nation’s history, perhaps in the 1940s, hospitals and doctors offices became a place of business, not an institution for health. There is no money in homeopathy. No one will get rich from selling or prescribing it. But you can use it at home and keep your family healthy and happy. Homeopathy works and has no side effects. It’s one of those rare, too-good-to-be-true lotteries that I wish more people knew about. Manuka honey comes from New Zealand and is a perfect example of how the earth plays a part in human healing and wholeness. (Like when you step on the wet morning grass with bare feet it helps rebalance your electrical energy. Yes, I have become such a hippie.) Manuka honey can be used for so many family needs such as wound healing, gingivitis, sore throats, to boost immunity, and treat allergies. Make sure the Manuka honey you purchase is verified for its quality. If you have kids, Activated Charcoal is a must-have remedy. We have removed much of the toxic chemicals and over-the-counter drugs from our home but my greatest fear is for my son to eat something poisonous. Activated charcoal can be given orally when poisoning is suspected because it binds with substances in the GI tract and makes them pass through without being absorbed by the body. Better to have and not need than to need and not have. Always call poison control whenever poisoning is suspected and tell them you have activated charcoal on hand. Activated charcoal is also a great way to detox skin and whitens teeth. Bentonite Clay, also known as “healing clay,” is full of minerals and very effective at absorbing toxins. I use bentonite clay to treat yeast diaper rash and as an alternative to commercial baby powder. I also put a tsp of bentonite clay in our morning smoothie once a week to help remove toxins from our digestive tract. Postpartum moms, this one is for you. Calendula cream is my go-to remedy for postpartum hemorrhoids. I had one heck of a time pooping after I had my son. I dreaded going to the bathroom and braced myself for terrible pain every time. I started using this Calendula cream topically and the pain slowly started easing up until it was gone entirely. I highly recommend Calendula cream! For complicated health issues, a naturopathic physician is a wonderful resource. The American Academy of Naturopathic Physicians has a directory to find one in your local area. I also keep a small library of reference books at my house for a quick lookup when family illnesses come up. I use this to treat specific symptoms such as a runny nose, itchy eyes, insomnia, sore throat, headaches, etc with homeopathy. I reference this frequently for using essential oils safely with children, to guide dosing, and find new uses for specific problems. I often refer to this book to learn how to use herbs in my homemade recipes. I started with this book as a beginner and found it very helpful! Before I end this post, I would like to take a second to talk about one more thing. Good health comes down to a few things that are inside of our control and one that is not. Our genetics form the foundation of our health, so if you have a family history of a particular disease and you are interested in natural treatment, it is best to see a variety of doctors including an integrated medicine/naturopathic physician to be part of your team. Unfortunately, we can’t outrun our genetics. Sometimes natural remedies won’t touch our health problems but they can be used to support the body through more aggressive treatments. We can’t control how our genetics shape our physical health but we can control how we nurture our bodies. If you want to have an overall healthy life, start with the basics. Feed your family organic, non-GMO food. Get plenty of rest. Try not to stress too much. Exercise regularly. I realize most of this advice may seem like boring ol’ common sense and even anticlimactic, but if you commit to incorporating them into your life, you will not only see improvements in your health but you may even prevent the development of a terrible disease. You are supporting your body the best you can while you live this life.